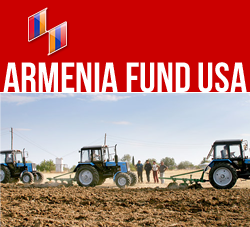 NEW YORK, New York — Hayastan All-Armenian Fund has begun constructing a brand new school in Ashotsk, a village in Armenia’s Shirak Region. The project is sponsored by the Fund’s French affiliate. Shirak is a province located in the northwest region of Armenia, bordering Georgia to the north and Turkey to the west. Its capital is Gyumri, which suffered notable and devastating effects from the 1988 earthquake, leaving the city’s structures in shambles. The Fund has built and renovated numerous schools and residential housing across the Shirak Region, with the school in Ashotsk being its current project. The future campus in Ashotsk will consist of four wings: two buildings for classrooms and administrative offices, a gym and a structure which will house an events hall. Designed to accommodate up to 360 students, the school will be equipped with central heating and air conditioning. The site will also feature a sizeable playground, which if up to the children would be deemed the most vital component of the school. With earthwork completed and the foundations laid, crews are currently building the school’s reinforced-concrete columns. The project is expected to be completed by May of 2013. The community’s existing school was built in the 1970s when Ashotsk was an industrial center. Accordingly the town boasted a 5,000-square-meter campus, large enough for over 1,000 students. In time, however, Ashotsk saw a steady decline in population numbers while the old campus, which lacks central heating, fell into disrepair. Today the student population of Ashotsk stands at approximately 300. Providing villages like Ashotsk with suitable and functioning school buildings is the first step in ensuring that children in Armenia are receiving valuable education. Improving education in Armenia will ensure that children today can be strong leaders for Armenia in the future.